1768-1847. He was born on 5 February 1768, the third son of James Stopford, second Earl of Courtown, and of his wife Mary Powys, a niece of the Duke of Montagu. One of his brothers was Lieutenant-General Hon. Sir Edward Stopford. Stopford’s early education was at Eton before on 31 May 1780 he entered the navy aboard the Prince George 98, Captains William Fox and James Williams, being the flagship of Vice-Admiral Hon. Robert Digby. On 12 April 1781 the Prince George was present at the second relief of Gibraltar, and in the autumn she took Digby’s flag out to North America where that officer shifted into the Lion 64. Remaining on the Prince George with Captain Williams, Stopford subsequently fought at the Battles of St. Kitts on 25-26 January 1782 and at the Battle of the Saintes on 12 April. In December 1782 at New York he moved to the French prize frigate Aigle 40, Captain Richard Creyke, and just a month later joined the sloop Atalanta 14, Commander Thomas Foley, being employed as a midshipman and acting-lieutenant, and assisting in the resettlement of American loyalists at Annapolis in Nova Scotia. He next joined the Hermione 32, Captain John Stone, seeing service in the frozen St. Lawrence before being commissioned lieutenant on 15 July 1785 and returning to England in the autumn. A young Captain hon. Robert Stopford. Stopford saw service at Newfoundland from March 1786 aboard the Salisbury 50, Captain Erasmus Gower, the pennant ship of Commodore John Elliott, and having been appointed her first lieutenant he commissioned the Centurion 50 at Chatham in February 1789. In the event he did not sail with that vessel, for in May he was appointed to the Aquilon 32, Captain Robert Montagu, going out to the Mediterranean where he was promoted to the command of the sloop Ferret 14 a month later on 2 June by Rear-Admiral Joseph Peyton. He temporarily commanded the frigate Ambuscade 32 from 5 December following the death of Captain William O’Hara, but returned to the Ferret when an Admiralty nominee, Captain Robert Devereaux Fancourt, was posted to the Ambuscade. During the Spanish Armament of 1790 he was despatched to England with information regarding the Spanish fleet at Cadiz, arriving at Falmouth in the first week of July. On 12 August 1790 Stopford was posted captain, and within a matter of days he was appointed to the Fame 74, which he fitted out for Rear-Admiral Phillips Cosby at Cork. For a few weeks in November he commanded the frigate Lowestoft 32, following which she was paid off. On 29 April 1791 he was appointed to the Aquilon 32, which he paid off that September but then recommissioned to sail for the Mediterranean in November. He was to command this frigate for the next three years, initially serving in the Mediterranean where he negotiated successfully with the Emperor of Morocco. Continuing with the Aquilon at the commencement of the French Revolutionary War, Stopford’s appraisal of the situation in Toulon called forth the occupation of that port from 27August 1793. Upon joining the Channel fleet the Aquilon acted as a repeater at the Battle of the Glorious First of June in 1794, where she also assisted the Marlborough 74, taking her in tow after she had been badly mauled, and receiving the approbation of Admiral Lord Howe and the King for doing so. At the end of June he took the King on a cruise to Cowes during His Majesty’s visit to the victorious fleet at Portsmouth. From 16 July 1794 Stopford commanded the Phaeton 38, initially cruising off Dunkirk and Ostend in watch over enemy frigates, and thereafter joining the Channel fleet. His ship served in Commodore John Willett Payne’s squadron that collected the royal bride, Princess Caroline of Brunswick, from Cuxhaven on 28 March. The Phaeton was later active in the capture of a Bordeaux convoy on 7 June 1795, but lost one man killed and seven wounded when attempting to cut out a corvette from under a battery on Belleisle in the same operation. Stopford played a particularly distinguished part in Cornwallis’ Retreat ten days later on 17 June by letting fly the Phaeton’s sheets and signalling to an imaginary fleet to convince the French that reinforcements were approaching. Continuing in the Channel with the Phaeton, he drove ashore and destroyed the Echoué 28 on the Ile de Rhé, and his squadron of three frigates captured the corvette Bonne Citoyenne 20 off Cape Finisterre on 10 March 1796, this vessel being part of Rear-Admiral Sercey’s East India-bound convoy which had departed Rochefort on 4 March, The Phaeton also took the Nantes privateer Actif 18 in the Channel on 6 March 1797. During the mutiny at Spithead from 16 April 1797 Stopford’s command remained conspicuously loyal. She was thereafter engaged successfully for some time in the Bay of Biscay against the enemy traders and privateers, captures in 1797 being the Chasseur 6 on 16 September, the British-built Indien 16 on 24 September, although she had to share this prize with the Unite 32, Captain Charles Rowley, which was in sight, and the Découverte 14 on 7 October in company with the Stag 32, Captain Joseph Sydney Yorke, and the Unite. The Phaeton then took the Hasard 14 on 28 December, and assisted the Anson 44, Captain Phillip Durham, in the recapture of the Daphne 20 in the Bay of Biscay on 29 December. The Phaeton’s remarkable run of success continued in the new year when she took the Aventure 18 on 1 January 1798, and the Légère 18 in the Channel on 19 February. On 22 March, being in company with the Canada 74, Captain Sir John Borlase Warren and the Anson, the Phaeton engaged a French frigate, the Charente 36, and drove her onto the rocks near the Cordovan Lighthouse. Unfortunately the Canada also took ground, and with the two frigates being distracted in hauling her off the Charente jettisoned her guns and made good her escape into the Bordeaux River. Thereafter Stopford took the Mercure 18 on 31 August in company with the Anson, and was also with the latter frigate in the day-long chase and capture of the Flore 36 off the Gironde on 6 September. Finally the La Rochelle based Fevier 14 was taken in the Channel on 8 October, the Hirondelle 20 on 20 November in the company with the Stag and the Ambuscade 32, Captain Henry Jenkins, the Résolue 18 on 24 November, and the Resource 10 on 6 December 1798 in company with the Stag. On 16 July 1799 Stopford was appointed to the recommissioned Excellent 74, and after sailing from Portsmouth to join the Channel fleet in early September he captured the corvette Aréthuse 18 off Lorient following an eight hour chase on 11 October. After entering Plymouth in early 1800 he sailed to rejoin the Channel Fleet in March, returning to Plymouth at the end of September before going round to the fleet’s rendezvous in Torbay a week later. In November his boats cut out three brigs from a creek near Abreverak, and following a return to Plymouth in January 1801 his boats cut the cutter Arc out from Quiberon on 20 February. In March, having briefly entered Falmouth, the Excellent came in to Plymouth for a refit, sailing out again at the beginning of April and then returning once more in July. Further service followed in the Channel, punctuated in early December by a celebrated venture through the Needles off the Isle of Wight, the Excellent being the only ship of that rate to have made that passage in a couple of decades. In early 1802 it was reported that the Excellent and a further number of sail of the line were being provisioned for five months’ service in the Channel, but as peace approached Stopford instead sailed from Torbay in early March for the Leeward Islands in command of six sail of the line, and with orders to help put down a mutiny by some black regiments on Dominica. After a short spell serving under the orders of Rear-Admiral Thomas Totty he became the senior officer on the Leeward Islands station when that officer returned home in ill health. With his broad pennant flying aboard the Excellent, commanded by Captain John Nash, he officiated in the handing over of enemy territory conversant with the Treaty of Amiens, and in the reduction of the naval force in those waters. Stopford remained on the Excellent until 28 May 1802 when he joined the frigate Castor 32, Captain Richard Peacocke, but he was taken ill in 1803 and returned to England in this vessel after being superseded by Commodore Sir Samuel Hood. After three months recuperation Stopford was appointed to the Spencer 74 in May 1803, and whilst recommissioning at Plymouth she temporarily flew the flag of Rear-Admiral James Richard Dacres in the Hamoaze. In August he sailed with livestock and vegetables for the fleet off Brest before returning to Plymouth in mid-October and then sailing at the end of the month for Brest once more. By the end of the year he was employed off Ferrol with Rear-Admiral Sir Edward Pellew, from where the Spencer returned at the end of January 1804 to Plymouth for a refit, and again in June for repairs after striking a rock on the Point of Ferrol. The Spencer went back to sea at the beginning of August, and after transferring to the Mediterranean Fleet she sailed with Vice-Admiral Lord Nelson in chase to the West Indies of the Toulon fleet, which had broken out on 29 March 1805. Unfortunately she missed the Battle of Trafalgar on 21 October as she was with Rear-Admiral Sir Thomas Louis’s squadron taking on supplies at Gibraltar. Shortly afterwards, on 9 November, Stopford was conferred in the honorary rank of colonel of marines. Following the Battle of Trafalgar the Spencer formed part of Louis’ squadron under the orders of Vice-Admiral Sir John Duckworth off Cadiz, and she sailed with the latter officer when he went in chase of a French squadron that had sailed from Brest. Stopford fought brilliantly at the resultant Battle of San Domingo on 6 February 1806, forcing the surrender of the Alexandre 80 whilst suffering casualties of eighteen men killed and fifty wounded on his command. Following the action, in which he was wounded, he sailed with the French prizes to Jamaica then returned to England where he was awarded with a gold medal for his part in the victory. In October 1806 Stopford was accorded a further honour when he was elected the M.P. for Ipswich in the navy and government’s interest, although he only held the seat for a year, and he left the country almost immediately after his election with instructions to take command of a squadron of three sail of the line, a frigate, a brig and a cutter, ferrying five thousand troops under Brigadier-General Robert Crauford to the River Plate. Departing Falmouth in November, he reached Porto Praya, but when the commander of the expedition, Rear-Admiral George Murray failed to arrive he proceeded to the Cape to make a rendezvous there. Returning to England in June 1807, Stopford was attached to Admiral Lord Gambier’s Copenhagen Expedition which forced the capitulation of that city on 7 September. He was also one of the officers who voiced their disapproval that their junior and his successor as M.P for Ipswich, Captain Sir Home Riggs Popham, had been appointed captain of the fleet, although Stopford himself may have been overlooked as it was claimed that he was inefficient. 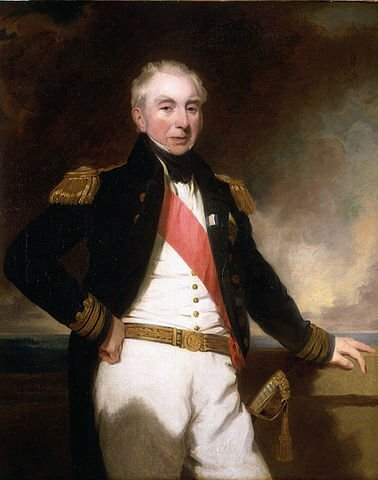 On 28 April 1808 he was promoted rear-admiral, and remaining in the Spencer commanded by Captain John Quillam he was initially stationed off Ferrol. From February 1809, after taking passage in the Amethyst 36, Captain Sir Michael Seymour, he led the blockade of Rochefort in succession to Rear-Admiral Sir Richard Strachan with his flag flying aboard the Caesar 80 commanded by the poorly regarded Captain Charles Richardson. 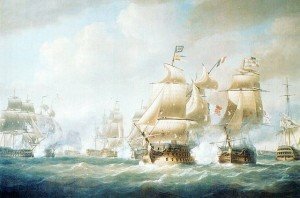 On 23 February his squadron of three sail of the line and three frigates drove three frigates from the Lorient squadron ashore on Les Sables d’Olonne, and the Caesar then formed part of Admiral Lord Gambier’s fleet at the Battle of the Basque Roads on 11 April. Stopford was one of several senior officers who volunteered to make the attack on the French fleet but was overlooked in favour of the junior Captain Lord Cochrane, and when he attempted to assist Cochrane with a fireship assault the Caesar ran aground. 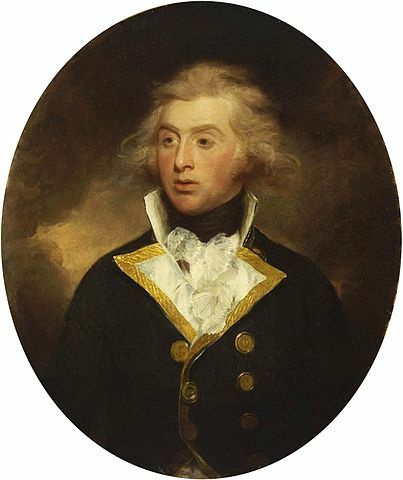 Having supported Cochrane to the best of his ability during the action Stopford went on to support his admiral at the bitterly argued court martial which inquired into Lord Gambier’s conduct. Returning to his station, his flag flew aboard the Scipion 74, Captain Charles Bateman, during September. In the autumn of 1810 Stopford was appointed commander-in-chief at the Cape with his flag aboard the Scipion 74, Captain James Johnstone, and with instructions to capture the Isle de France, although this was achieved before his arrival due to brilliant campaigning by Commodore Josias Rowley and an overwhelming display of force by Stopford’s predecessor, Vice-Admiral Albemarle Bertie. After Vice-Admiral William O’Brien Drury’s death in 1811 Stopford removed on his own initiative to the East Indian station and assumed the naval command of the successful Java Expedition, which force consisted of four sail of the line and fourteen frigates, and had already been conveniently assembled to proceed against the Isle de France. His arrival was less than welcome to the existing senior officer, Captain William Broughton, who requested a court martial at being superseded, but the officers and men of the fleet were more than content with Stopford’s arrival, and there followed the capture of Java on 18 September. He afterwards returned to his station at the Cape where his flag flew aboard the Lion 64, Captain Hon. George Douglas and the Nisus 38, Captain Philip Beaver. On 12 August 1812 he was promoted vice-admiral, and shortly afterwards he returned to England aboard the President 38, Captain Samuel Warren, arriving in April 1813 having received the thanks of the Houses of Parliament for his efforts in Java. After going on a tour he then entered semi-retirement for the next fourteen years. On 2 January 1815 Stopford was nominated a K.C.B., on 27 May 1825 was promoted admiral, on 6 June 1831 nominated a G.C.B. and on 10 May 1837 a G.C.M.G. From 17 April 1827 until 30 April 1830 he was the commander-in-chief at Portsmouth with his flag aboard the Victory 100, Captain Hon. George Elliott. Stopford returned to active service when from February 1837 until October 1841 he held the position of commander-in-chief in the Mediterranean with his flag aboard the Princess Charlotte 104 commanded by his brother-in-law, Captain Arthur Fanshawe, who had previously seen much service with him. In 1840 he conducted operations against Mehemet Ali when the government decided to support the Sultan of Turkey in his local difficulties in Egypt, and this put him in conflict with the French who supported the rebel pasha. During September the colourful Commodore Charles Napier joined Stopford, and the younger man immediately pursued a more vigorous campaign whilst his senior remained in the Dardanelles with the main body of the fleet. Syria was abandoned by Mehemet Ali after Acre had been successfully bombarded by Stopford and Napier on 3 November 1840, but their differing approaches were highlighted when Napier ignored his superior’s signal to implement a cease fire after a magazine had been blown up ashore. Stopford, who some said had only been employed because he was less ancient than all the other Napoleonic-era admirals, received honours from the Sultan of Turkey, Austria, Prussia and Russia, together with awards from the City of London and both houses of parliament, but although a peerage was suggested in the House of Lords there was some conjecture that he either refused it, or that the foreign secretary, Lord Palmerston, vetoed it. On 1 May 1841 Stopford became the governor of Greenwich Hospital, and he died at Richmond, Surrey, on 25 June 1847, being buried in Greenwich Hospital Cemetery. On 29 June 1809 he married Mary Fanshawe, the seventh of nine daughters of Captain Robert Fanshawe, the navy commissioner at Plymouth, and they had issue five daughters and three sons. Two of the sons, Robert Fanshawe Stopford, born on 19 December 1811 and posted captain in 1840, and James John Stopford, born 17 April 1817 and posted captain in 1841, served under him in the campaign with Mehemet Ali, and both reached flag rank. One of his daughters married Lord Henry Russell but predeceased her father. His nephews included Captain Hon. George Montagu Stopford, born on 11 November 1798, who served with him from 1810 and was posted captain in 1825, Captain Richard Henry Stopford, born on 22 November 1803 and posted captain in 1845, Commander Edward Stopford, born on 20 August 1809 and promoted to that rank in 1841, both of the latter-named officers having served as his flag-lieutenant at differing times, and Lieutenant-Colonel Hon. Edward Stopford. He was the brother-in-law of Vice-Admiral William Bedford, Admiral John Chambers White, and Admiral of the Fleet Sir Thomas Martin. His address was given as Midhurst, Hampshire, and he also lived at Upper Harley Street, Cavendish Square, London. Stopford enjoyed almost constant employment through the benefit of his family connections. He was a kind, humane, gentlemanly officer who was well regarded by his men, whilst also being steady and cool in action.